* Radish (muli) could prove to be useful home remedy in piles. Mix radish juice with a bit of salt and take it twice a day for around one and a half month. * Mix lemon juice with fresh milk (unboiled) and use this recipe for about 7-8 days. * Pound ripe Neem seeds into a fine powder. Mix some of the powder with honey and have it daily in the morning. * Make it a habit of drinking sour buttermilk (free from fat) daily every morning. * Squeeze one half of a lemon to extract the juice and add salt to taste. This recipe helps to control bleeding in piles. * Roast fenugreek (methi) seeds and grind the roasted seeds into a fine powder. Mix a teaspoonful of this powder with a cup of buttermilk and have this twice a day. * Collect fresh neem flowers. Mix it with equal quantity of powdered sugar. Mix thoroughly and fill this in a glass bottle and keep it in sunlight for a month. One teaspoon of this preparation should be taken daily every morning. Piles can be cured through the regular use of this recipe. * Hareetaki or Harad (Terminala Chebula) should be taken with jaggery at bedtime to cure constipation. * Around 11-15 rose petals should be crushed with water and should be taken on an empty stomach early in the morning. * Decoction of dry ginger (sonth) is also useful in piles. * Put fresh rose petals in a glass jar. Now add equal quantity of sugar to form a second layer. Keep on adding layers of petals and sugar alternately. Then stopper the jar tightly and keep it in sunlight for a month. This is called as Gulkand. Read the post Homemade Gulkand - Rose peta Preserve / Jam. Take a teaspoon of this jam at bedtime with a cup of milk. It cools and soothes your system, purifies blood and is an excellent remedy for constipation and piles. Radish juice taken in the morning and night. Start with 1/4 a cup and increase to 1/2 a cup gradually over a period of 1 month. Onion - about thirty grams of finely ground onion and add about 60 grams of sugar. This should be taken twice daily to have a good relief from bleeding and dry piles. Cumin seeds - powder one tablespoon of roasted and unroasted black cumin seeds. Half tablespoon with a glass of water once a day is an effective home remedy for piles. Ginger - half a teaspoon of fresh ginger juice when mixed with one teaspoon of fresh lime juice, mint juice and honey is an effective medicine for piles.Rice gruel with a glass of buttermilk and ripe banana is extremely soothing on the digestive system. Sesame seeds - are effective for bleeding piles when it is ground to a paste and given with butter. Try Sarson ka tale(Mustured Oil) on your the problem area of piles in morning and evening. Using turnip leaves as a juice diluted with water, about 100 ml juice is used twice a day .Using figs are also helpful for piles. Fresh butter milk itself is useful for this condition. juice extracted from the Tamarind flowers is given internally for bleeding piles. Boil few grams of sesame seeds in water till it is decreased by one-third, or as sweetmeats. Ground to paste with water, they can be given along with butter for bleeding piles. Mango seeds are an efficient remedy for piles. 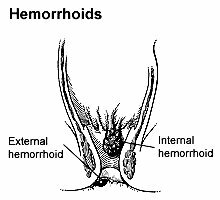 exercise can actually help you avoid getting hemorrhoids the second time around. Keeping your body in regular motion can improve circulation by the rectal area and thus, allows for easier bowel movements. mix 3 tablespoons of sugar with a small sliced onion in a bowl. It's bound to create a strange flavor, but consuming this twice a day will work wonders to cure hemorrhoids or bleeding bowel movement. Juice extracted from the flowers of tamarind is given internally for bleeding piles. Soak 15 gms. Amla and 15 gms. of mehandi (myrtle) leaves overnight in 400 gms. water strain the liquid in the morning. Drinking this water checks piles. Taking 5 gms. of triphala churna with a glass of whey helps in curing piles. Also, taking fresh Amla juice with half tsp of ghee and 1 tsp. of honey and 100 gms. of milk-after lunch-cures even chronic piles problem.